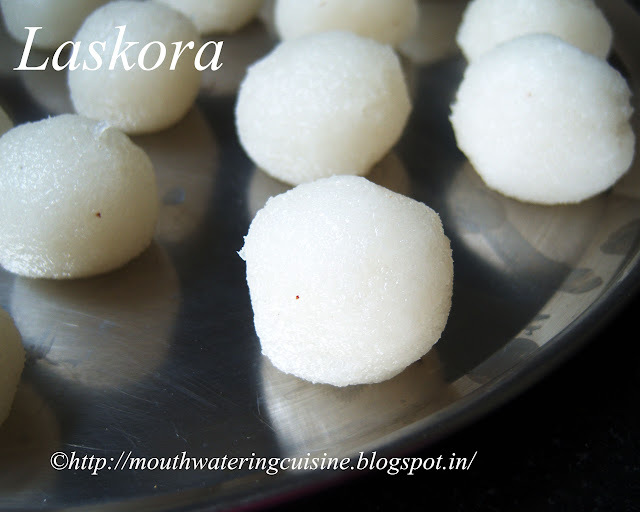 Coconut ladoo or Laskora is a very interesting and traditional sweet made with fresh coconut and sugar. Whenever I have fresh coconut in my pantry I tend to make some sweet with it. 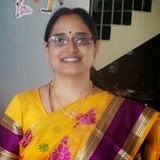 Some people make sweet by mixing coconut and jaggery, it is dark in appearance. But this one looks milk white in colour. And tastes awesome and melts in mouth. We need to remove the darker skin of coconut. We can use peeler to do this. Some people use mortar and pestle to get the coconut milk, but it is a bit tough job. So we can use mixer grinder to do this. In India we get fresh coconut, we buy them and break it on a hard surface. Remove the meat or flesh from the hard nut shell and use it. Chop it or grind it and keep it in the refrigerator for further use. We even can make coconut powder also. Separate the flesh from the hard nut cover. Peel the darker skin of the coconut. Blend it in the blender jar to make coarse powder. We can scrape it also. Add sugar to it and heat this mixture in a kadai. Let the sugar melts. Stirring it occasionally. Bring this to boil. Once it reaches the desired consistency, remove it from heat and allow this to cool. Do not cool completely, When it is warm enough to blend, blend this mixture in the blender jar. This process releases the coconut milk and mixes with sugar syrup. 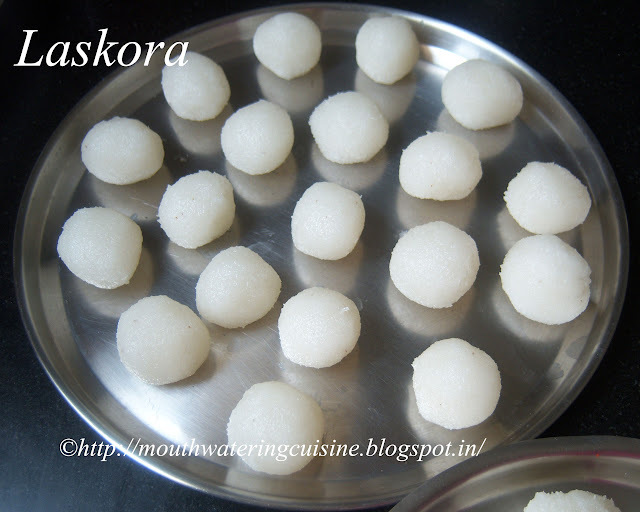 Make ladoos of desired size. Allow them to cool for ten minutes. Serve coconut ladoo anytime. Keep them in an airtight container for three to four days. For more sweets and snacks click here. Thank you visiting my blog. Hope you liked all my recipes. Any feedback and comments are appreciated.